The Vizcaya Museum and Gardens shimmer in the reflection of Biscayne Bay, retaining the dream-like vision of farm-equipment heir James Deering, who chose the spectacular spot for his elaborate subtropical interpretation of an eighteenth-century Italian villa. 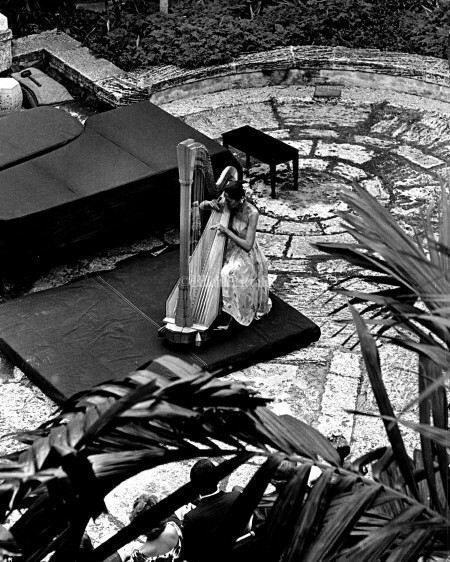 The once-private property, built between 1914 and 1922 in the Coconut Grove area of Miami, is surrounded by nearly 59 acres of serene Italian renaissance gardens with stone fountain creating a setting for countless photographs. 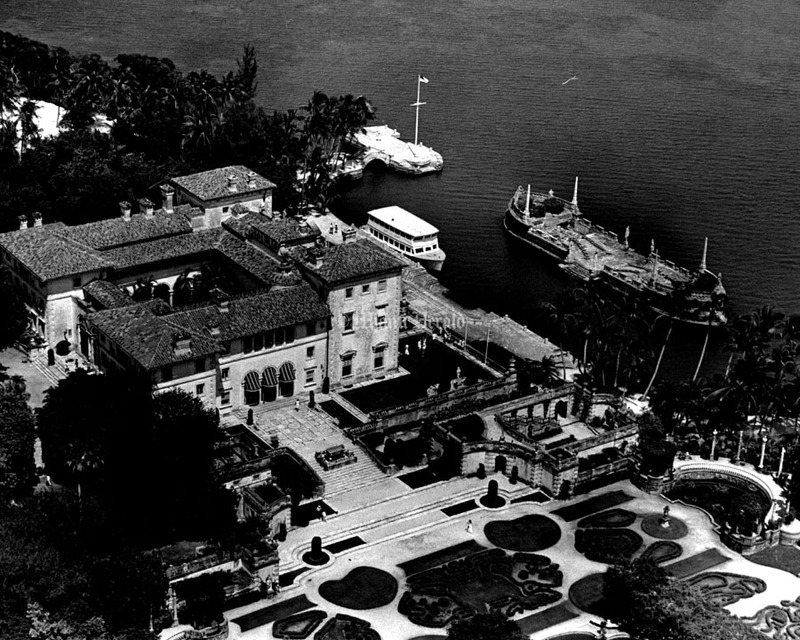 Now owned by taxpayers, the grand estate includes a Milan-inspired music room, Venice-inspired bedrooms, billiards and smoking rooms, a vast collection of art and a swimming pool that emerges from vaulted arches at the lower level of the house. 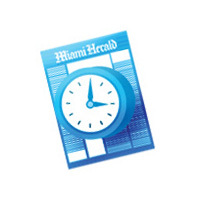 Damage from Hurricane Wilma in 2005 has mostly been repaired. 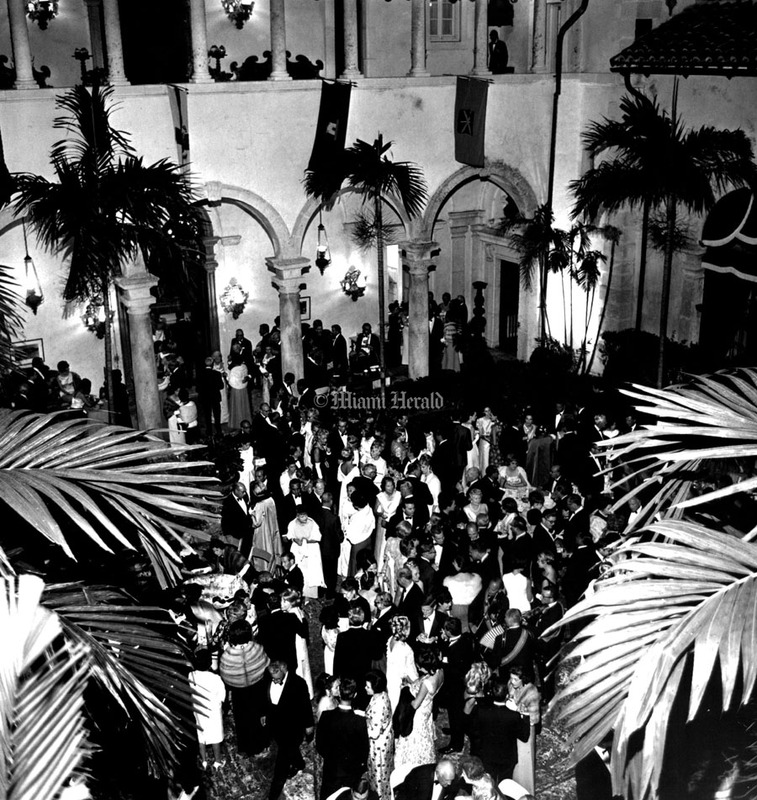 A National Historic Landmark, the property has hosted high-society parties for decades — and a legendary annual Halloween party known for elaborate costumes. 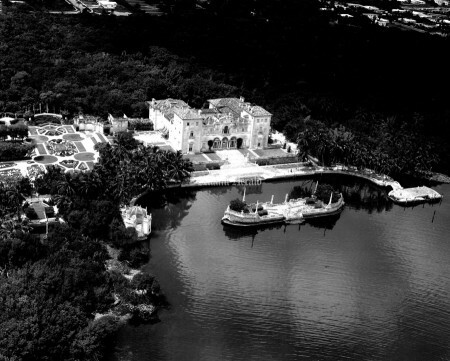 Vizcaya, set amidst mangroves and hardwood hammock, played an important role in South Florida’s development, with Deering – one of the country’s richest men — employing about 1,000 people during construction in the 1910s, including Italian and Bahamian craftsmen and laborers, many of whom settled in Miami. 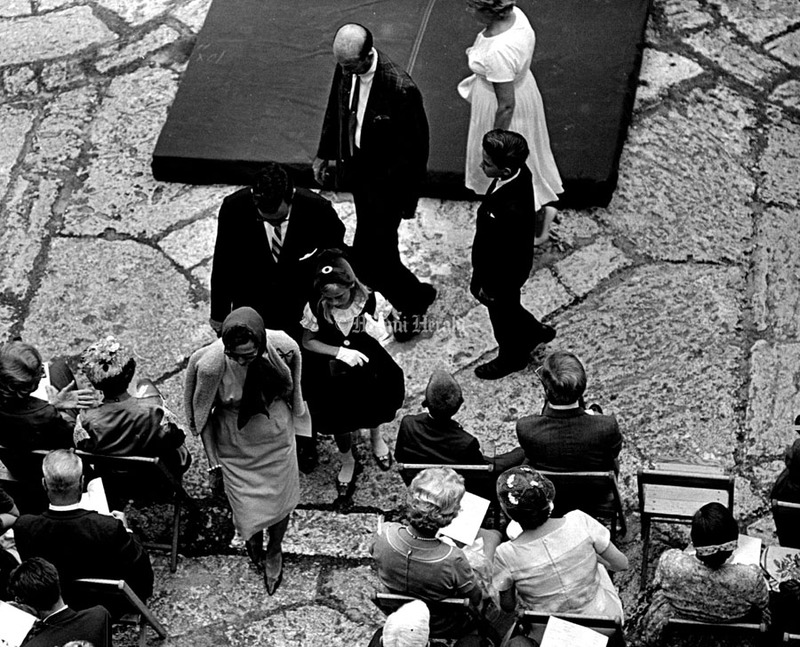 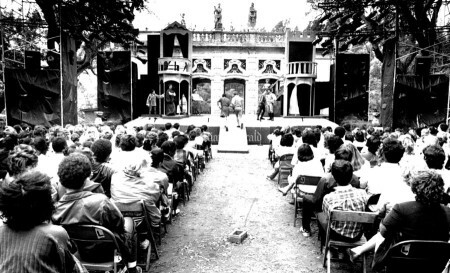 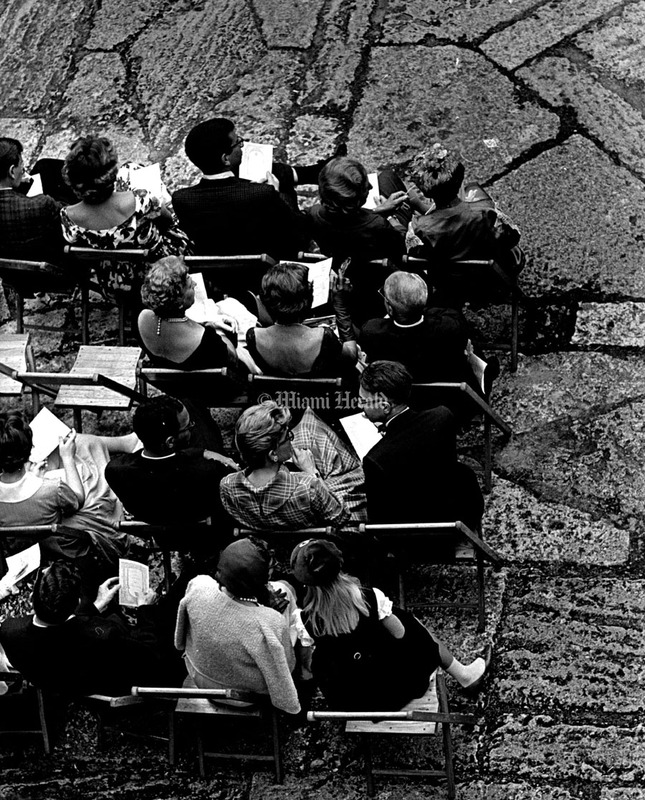 Undated: While Taming of the Shrew goes on, Cathy Stahre, who plays a servant in the play, follows along with a script behind the stage on the stage on the mound at Vizcaya. with the statue looking down on her. The troupe performed for school children Tuesday a.m.
7/8/1984, Pete Cross/Miami Herald Staff: Marlene Nelson & Dennis Carroll row their canoe towards Vizcaya from Key Biscayne to see the sound & light show 8:00 pm. 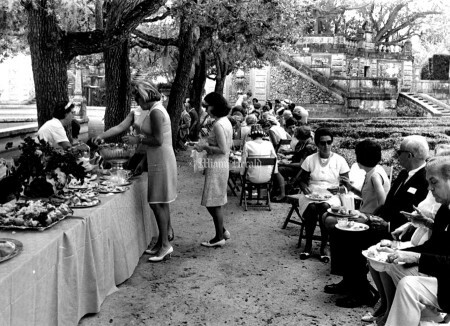 The Canoe trip was part of the Historical Society. 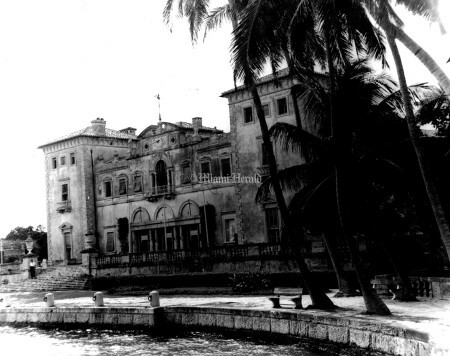 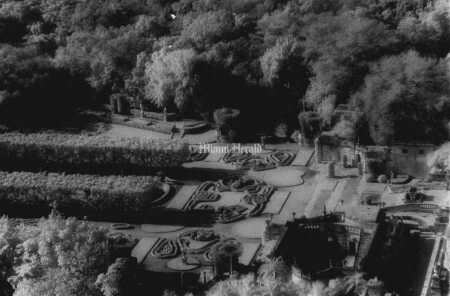 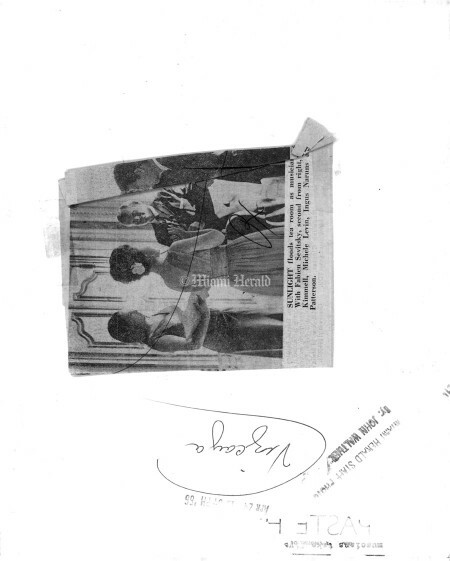 4/13/1981, Keith Graham/Miami Herald Staff: Vizcaya is asking for money from the state legislature to repair and restore problems at Deering's estate. 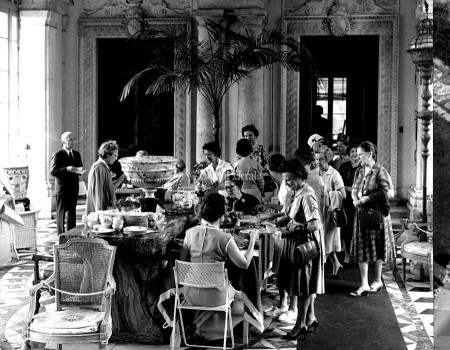 Among the problems is the cracks in the 2nd Floor breakfast room. 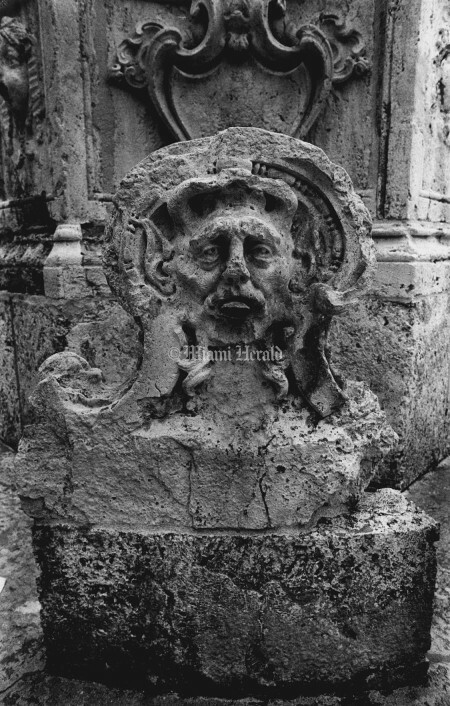 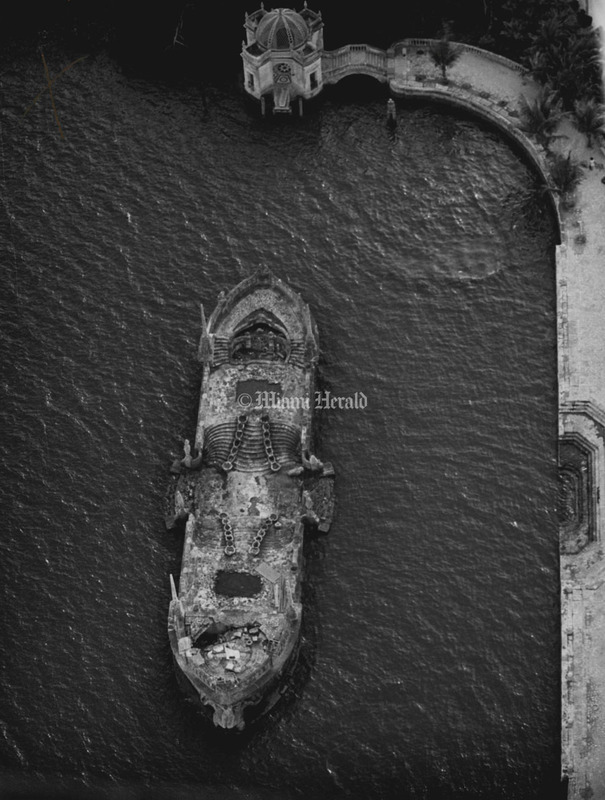 1/20/1988, Tim Chapman/Miami Herald Staff: Vizcaya. 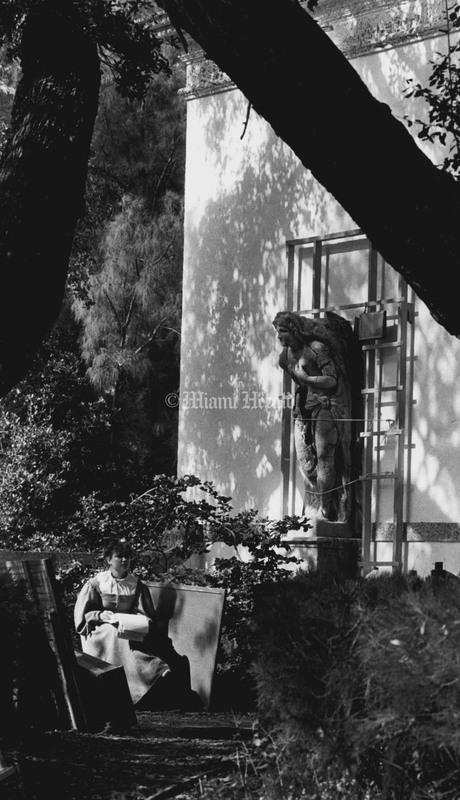 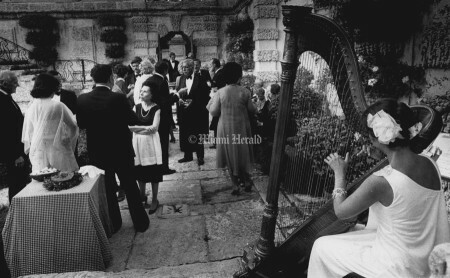 11/12/1988, Albert Coya/Miami Herald Staff: Cornucopia of the Arts at Vizcaya. 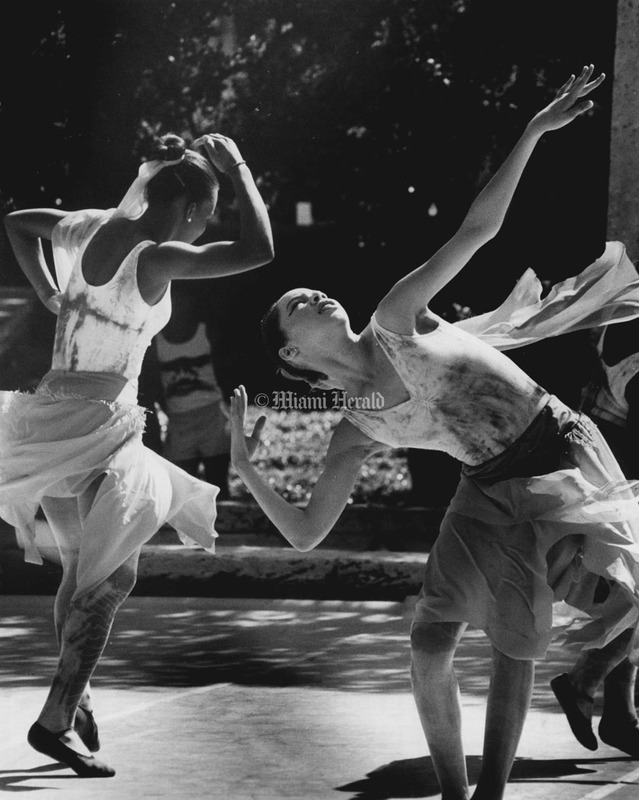 Miami Liberty City Dance Theatre member Miami Liberty City Dance Theatre Miacarla Beck, right and Michelle Grant dancing modern jazz. 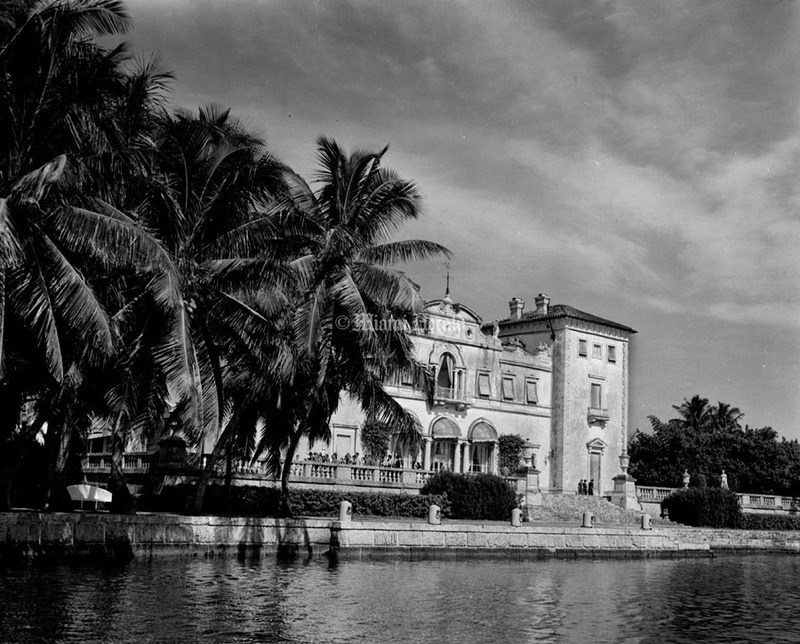 7/22/1962: For some years after James Deering died in 1925, his Italian-style palazzo was still enjoyed as a winter home by his inheritors. 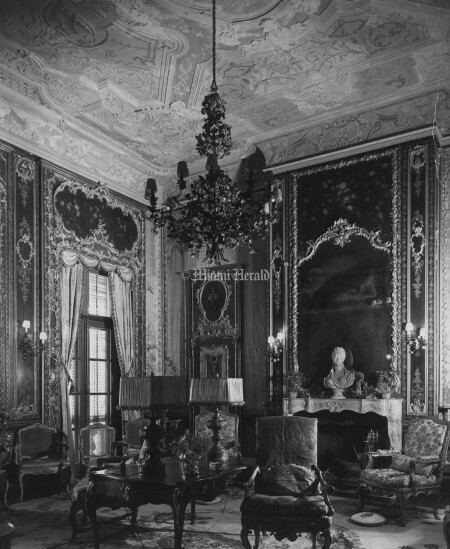 This photograph of the reception hall on the first floor shows the over-abundance of furnishings and down-filled comfort which characterized the rooms of the mansion. 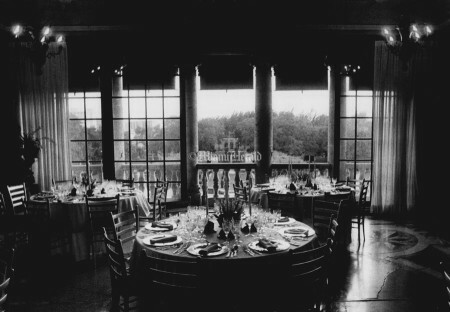 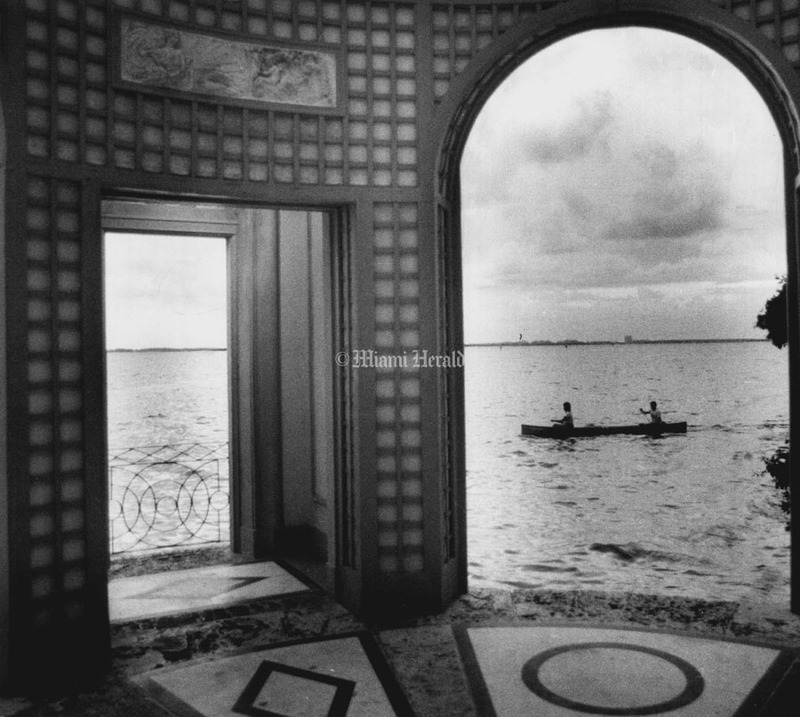 As in some modern homes today, Vizcaya's decor was a mixture of many periods and origins. 3/22/1971, Doug Kennedy/Miami Herald Staff: Three robbers lured an elderly guard at the Vizcaya museum from his office, overpowered him and stole a valuable antique silver collection. 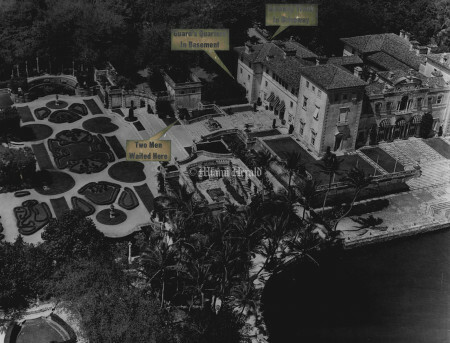 This graphic depicts how the robbery played out. 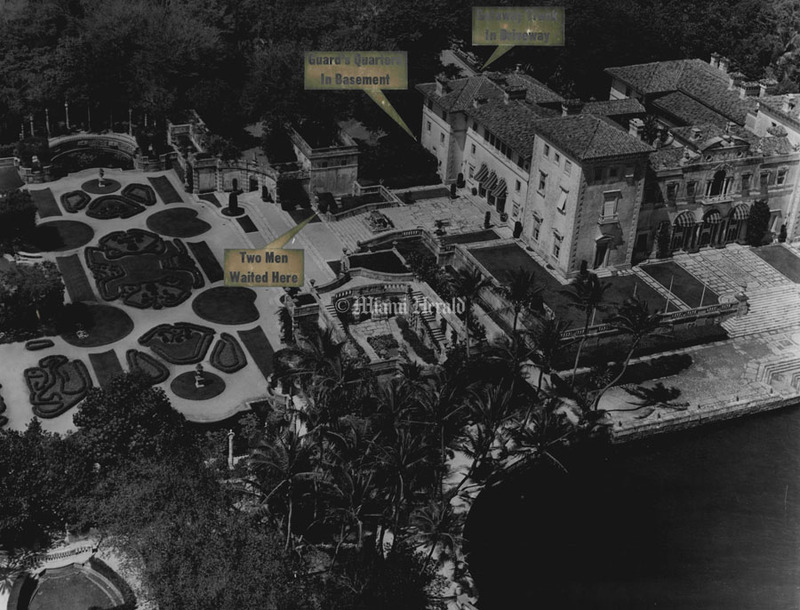 3/23/1971, Doug Kennedy/Miami Herald Staff: 3/22/1971, Doug Kennedy/Miami Herald Staff: Three robbers lured an elderly guard at the Vizcaya museum from his office, overpowered him and stole a valuable antique silver collection. 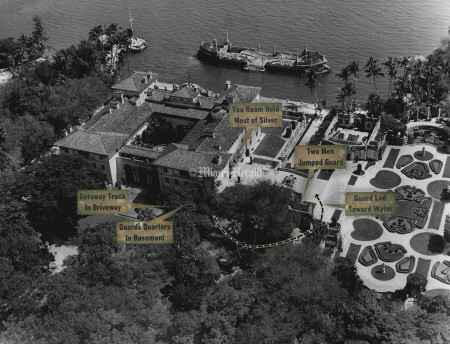 This graphic depicts how the robbery played out. 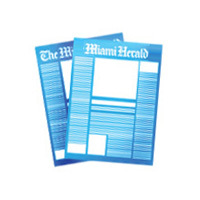 3/11/1977, Bob East/Miami Herald Staff: Very slow boat to nowhere. 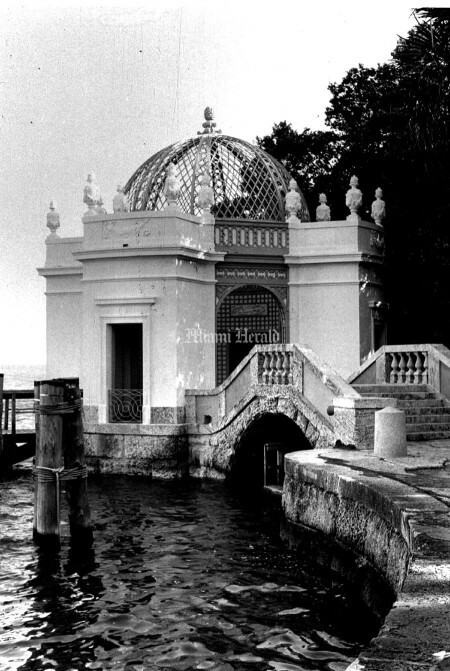 Stone barge off Deering Estate at Vizcaya. 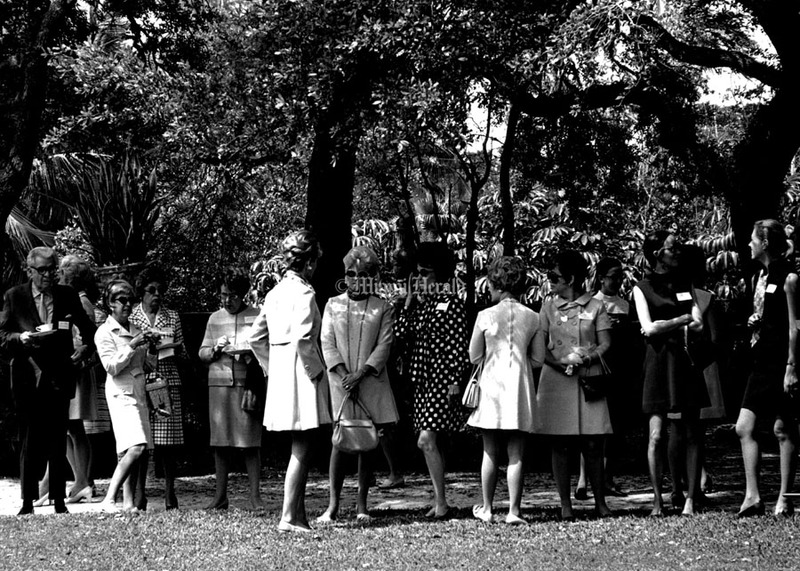 11/14/1964, Mike Freeman/Miami Herald Staff: Vizcaya. L to R: Mrs. Thomas B Duff, Mrs Evans Barosa and Mrs Harold E David. 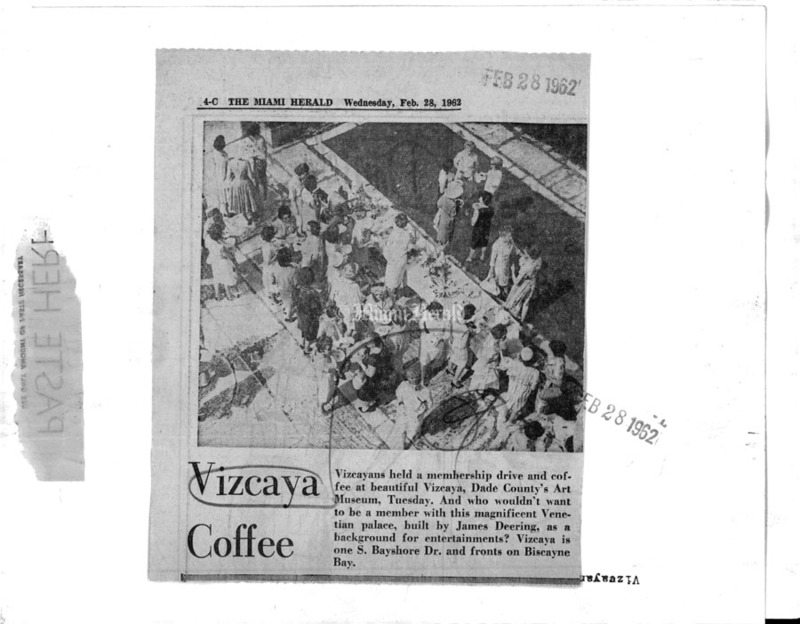 4/8/1962, Ron Wahl/Miami Herald Staff: Vizcayans. 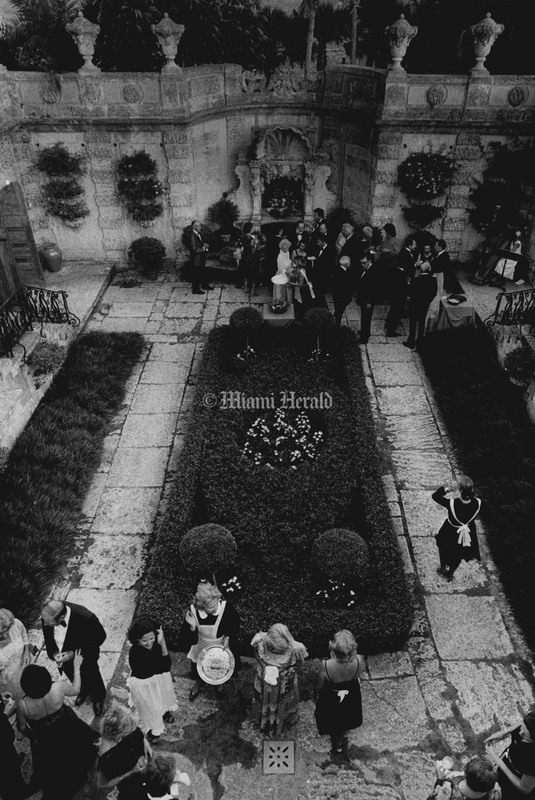 4/19/1971, Gus Schuettler/Miami Herald Staff: Vizcaya Fête champêtre. 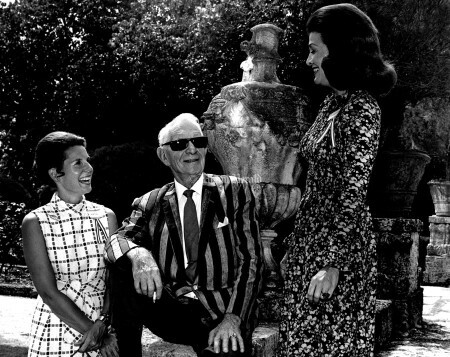 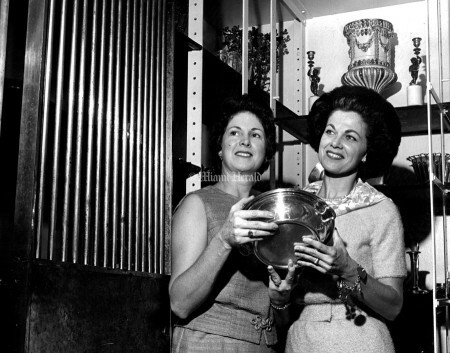 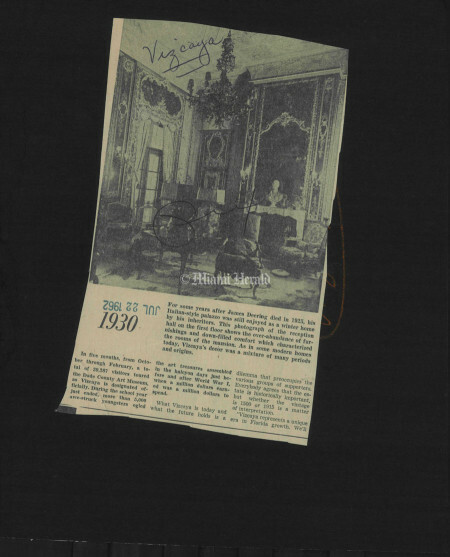 10/8/1963: In the late James Deering's bank sized, iron barred door silver vault at Vizcaya, Mrs. J. Calvin Jureit and Mrs. Edward Cameron hold a silver bowl from Mr. Deering's yacht. The vault and serving pantry at Vizcaya have been done over by Polly (Mrs. Harold) Davis of the Vizcayans. 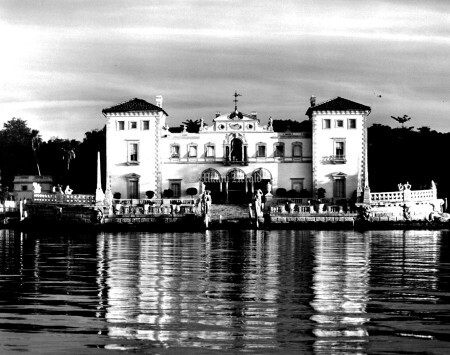 Current attraction at Vizcaya is a collection of silver march holders, flint lighters and boxes from around the World. These are from the collection of Mrs. Pope Dodge Coconut Grove. 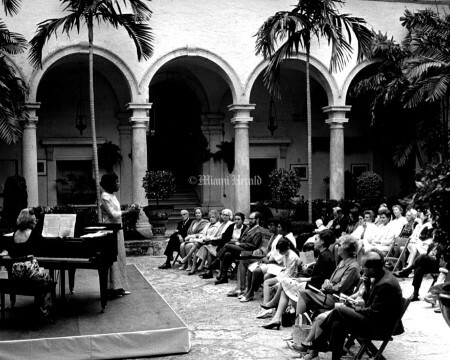 4/21/1974, George Kochaniec/Miami Herald Staff: L'Apache. 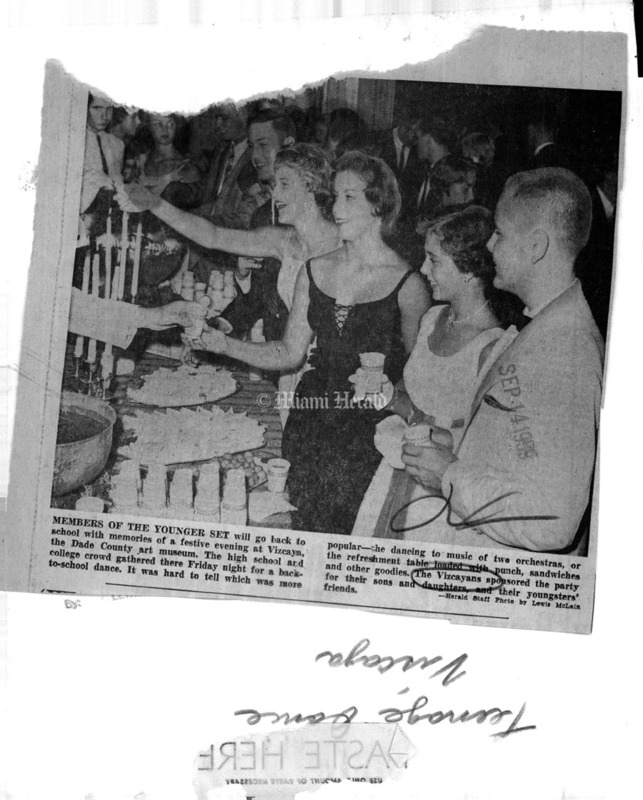 Herls and Mayda Johnson, Art and Mo Peary, Mil and Roz Jacobs, Bob and Marlies Indall, Fred McGilray. 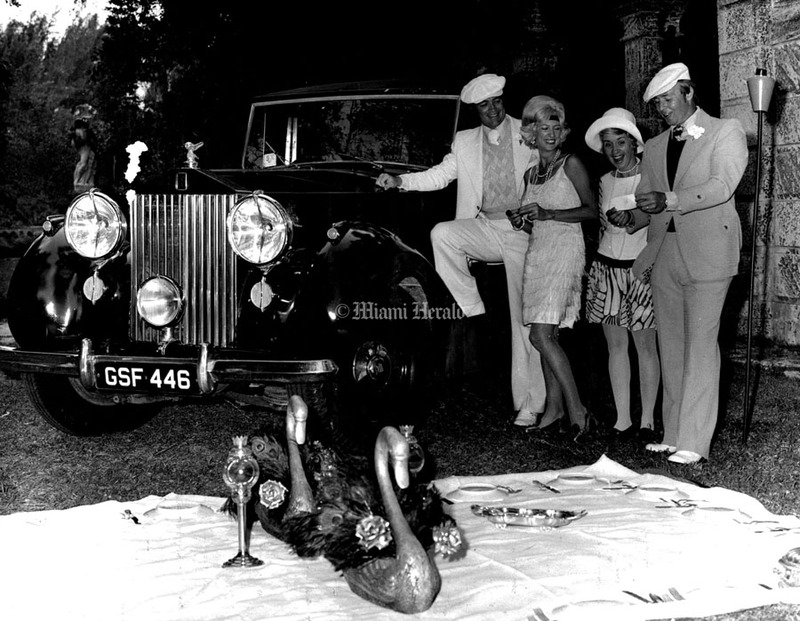 4/21/1974, George Kochaniec/Miami Herald Staff: The Great Gatsby. Walt and Shirley Wadsworth, Carolyn and Joe Farkas. 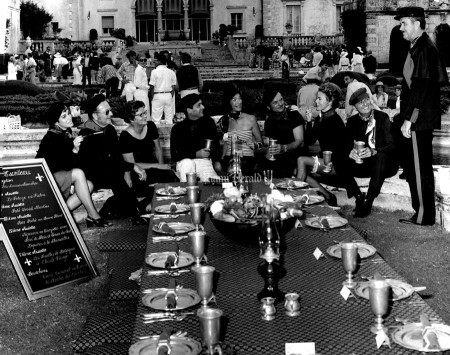 4/24/1966, John Walther/Miami Herald Staff: Vizcaya. 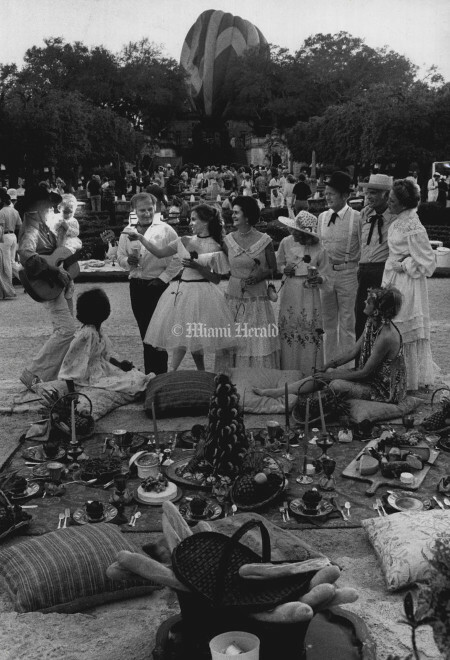 4/1/1979, Bob East/Miami Herald Staff: Fête Champêtre at Vizcaya brought out fancy picnickers all over the grounds - Including Joe Bruce who played guitar for daughter Blossom, 20 months. Grover Windsor of Chicago brought his hot air balloon in to be sure his chicken in the basket was kept warm. 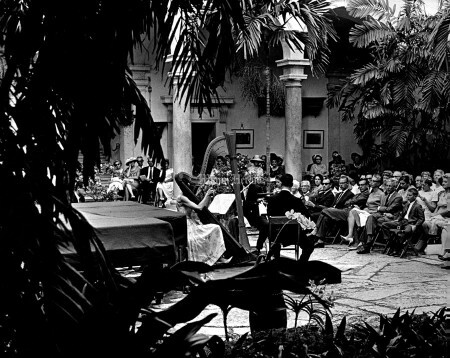 4/8/1962, Rob Wahl/Miami Herald Staff: Vizcanyans. 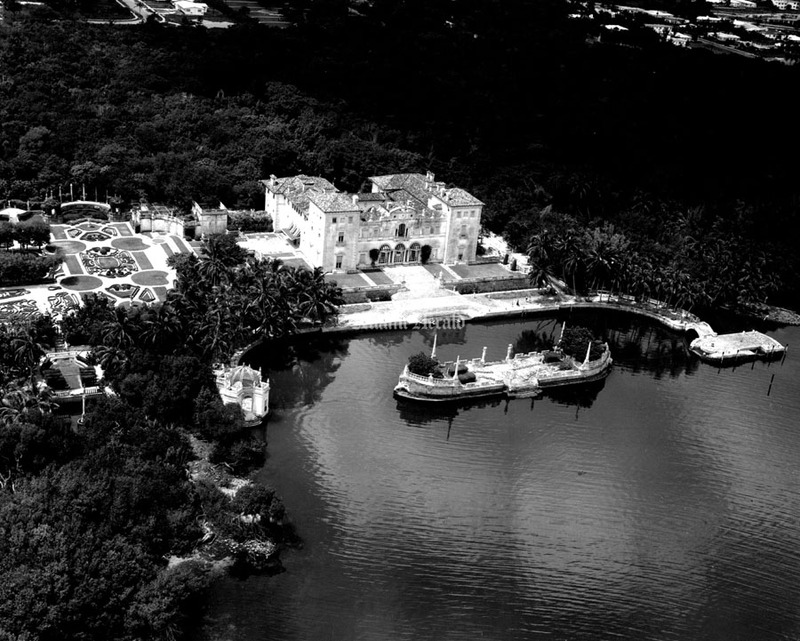 Undated, John Walther/Miami Herald Staff: Vizcaya. 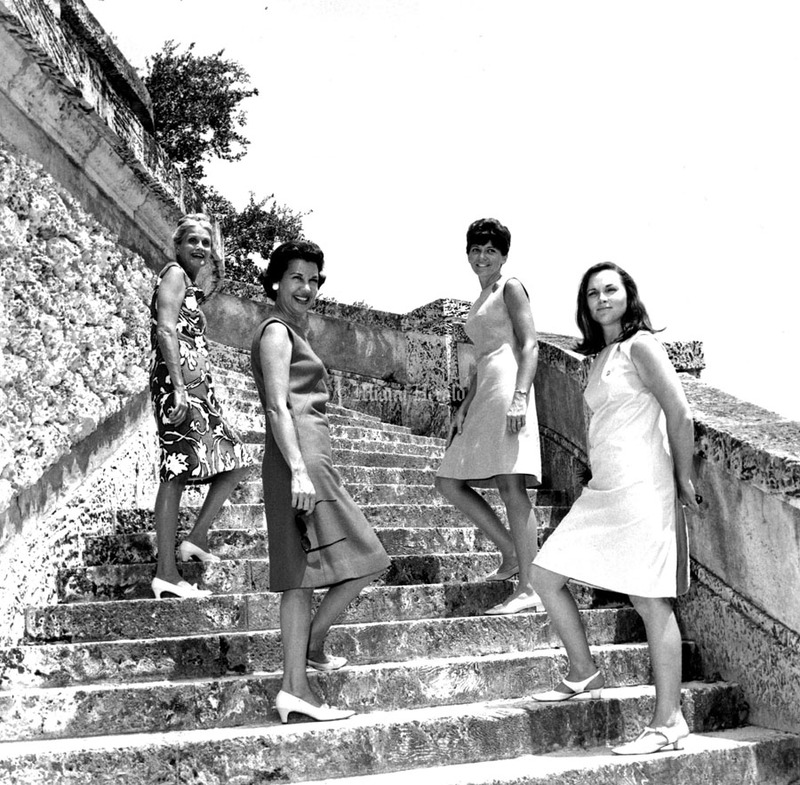 4/4/1978, Viani Navarrete/Miami Herald Staff: Members of La Lega Dei Vizcayani. 11/19/1961, Ken Krato/Miami Herald Staff: Mr. and Mrs. Irving McNayr, and Mr. Franco Scalamandre are greeted by Mrs. Fox and Stuart Cottman. 11/29/1963, Mike Freeman/Miami Herald Staff: General view Viscayan Ball. Romantic background of the Vizcaya Patio set 'Venetian' Scene. 12/21/1966, Jim Birmingham/Miami Herald Staff: Vizcaya. Festa dei Medici. Vizcaya Coffee. 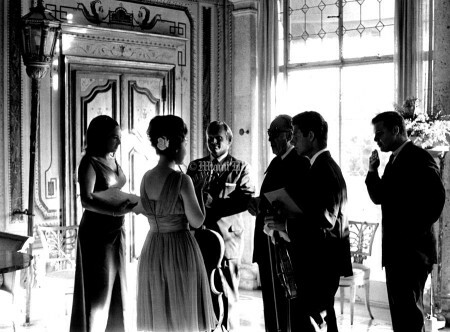 Vizcayans held a membership drive and coffee at beautiful Vizcaya, 2/28/1962: Dade County's Art Museum, Tuesday. 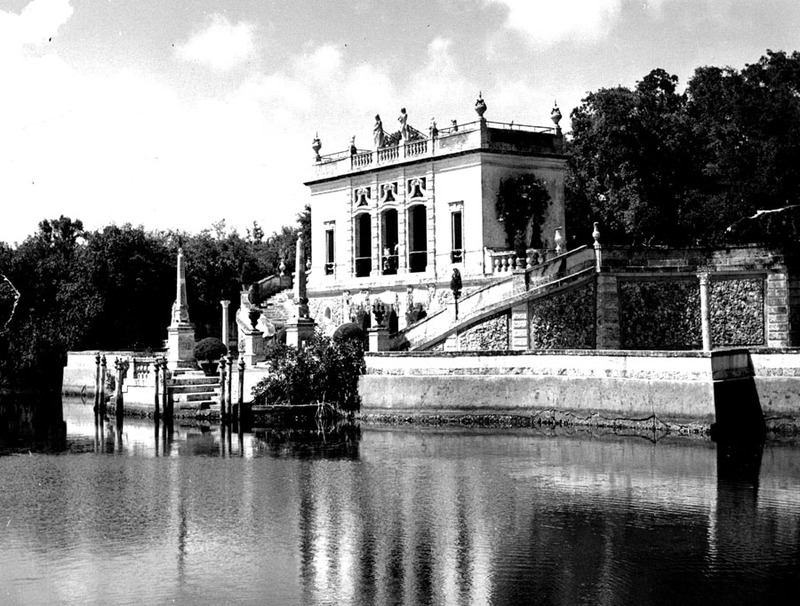 And who wouldn't want to be a member with this magnificent Venetian palace, built by James Deering, as a background for entertainments? Vizcaya is one S. Bayshore Dr., right on Biscayne Bay. 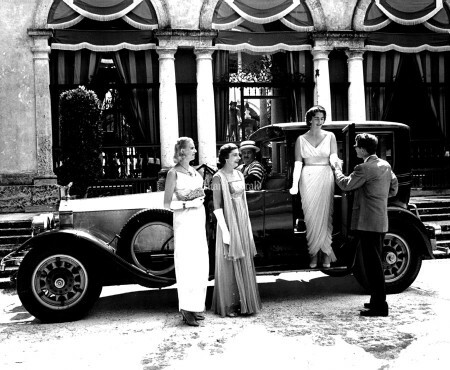 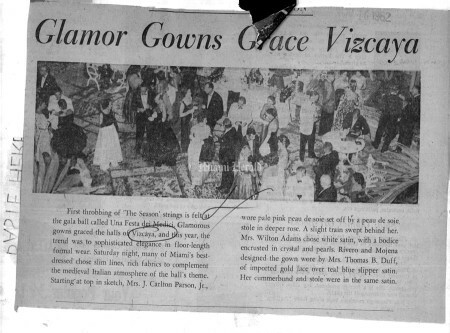 11/14/1959: Glamor Gowns Grace Vizcaya. First throbbing of The Season' strings is felt at the gala ball called Una Festa dei Medici. 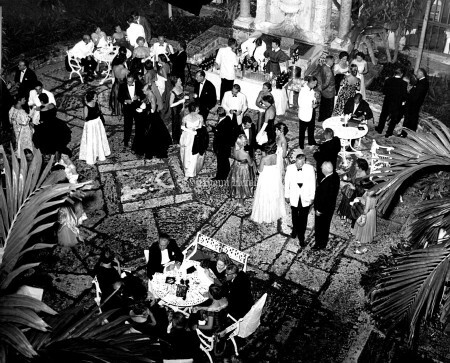 Glamorous gowns graced the halls of Vizcaya, and this year, the trend was to sophisticate elegance in floor-length formal wear. Saturday night, many of Miami's best-dressed chose slim lines, rich fabrics to complement the medieval Italian atmosphere of the ball's theme. 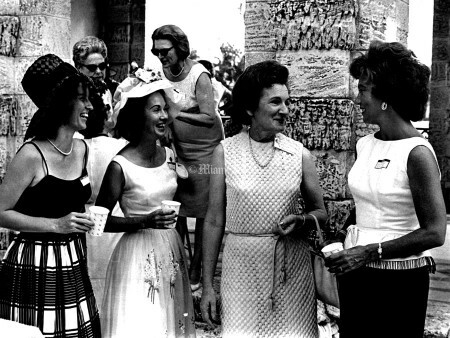 Starting-at top in sketch, Mrs. J. Carlton Parson, Jr.,wore pale pink peau de soie , stole in deeper rose. 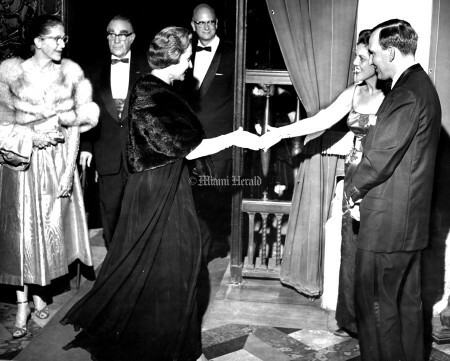 A slight train swept behind her. 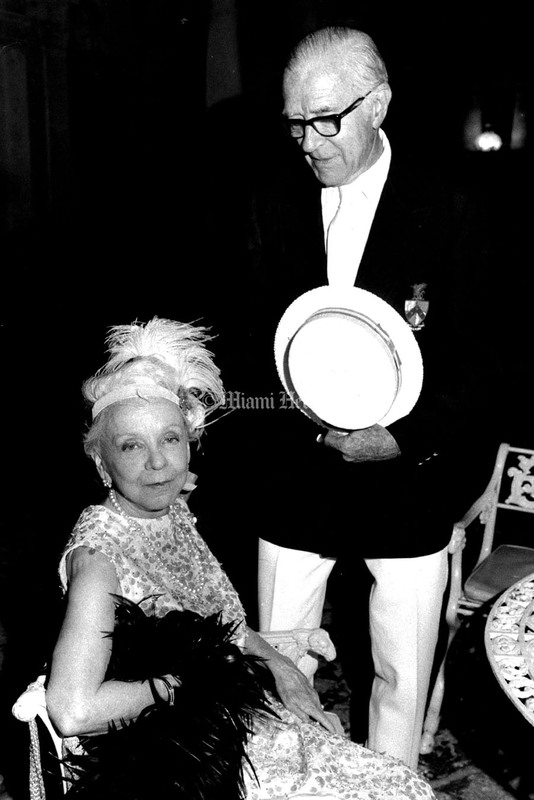 Mrs. Wilton Adams chose White satin, with a bodice encrusted in crystal and pearls. 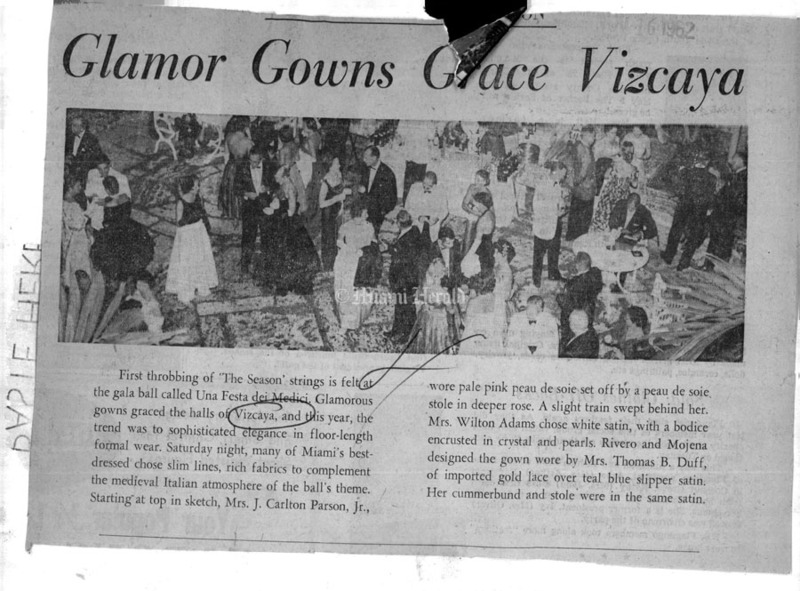 Rivero and Mojena designed the gown wore by Mrs. Thomas".13. 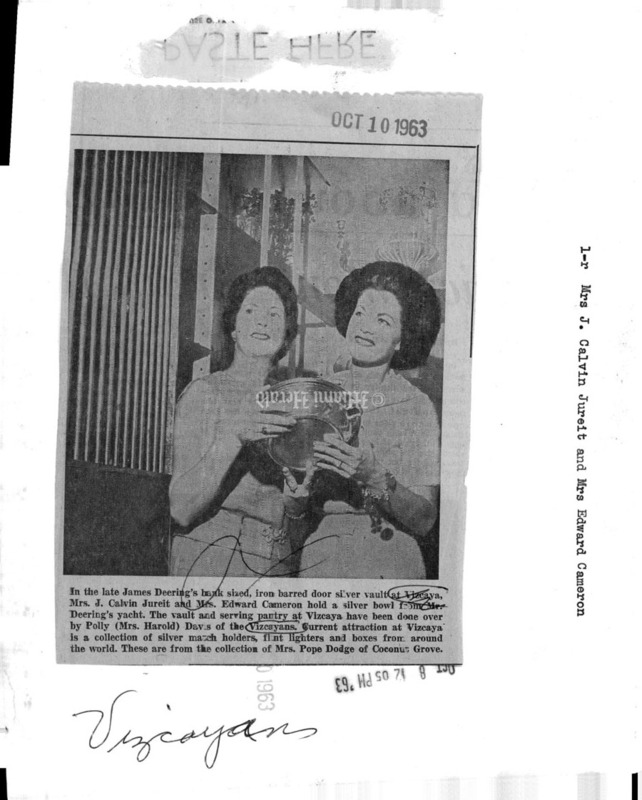 Duff, of imported gold lace over teal blue slipper satin. Her cummerbund and stole were in the same satin. Undated, Bob East/Miami Herald Staff: Vizcaya. 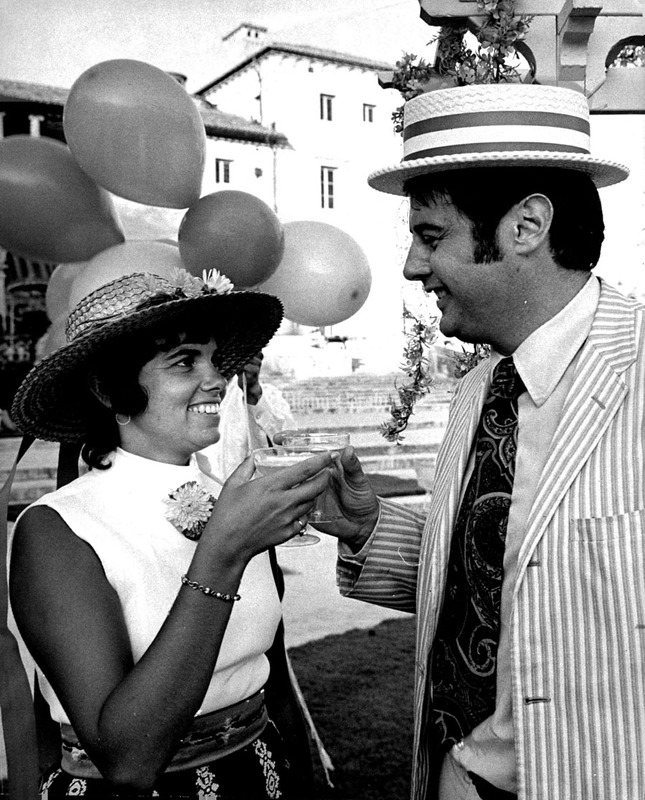 4/19/1971, Gus Schuettler/Miami Herald Staff: Vizcaya Fete Champetre. 10/29/1958: Mrs. Conway Hamilton, Mrs. WM. 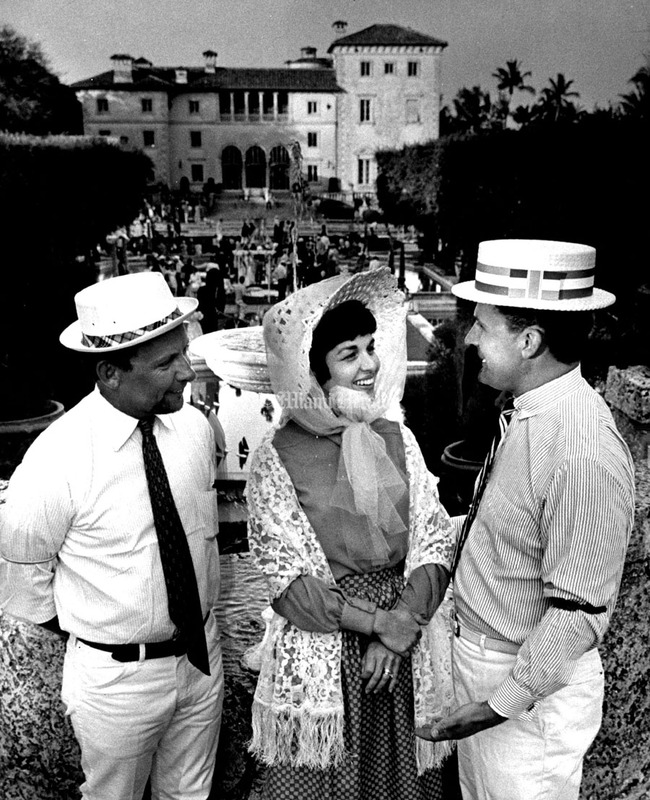 Beckham Jr., Art Wyman, Mrs. Phil Gallagher and Jim Wills at Vizcaya event. 10/31/1974, Bob East/Miami Herald Staff: New Vizcaya guides get a carnation - Mrs. Herbert Chauser, Mrs. Charles Whitcomb, Mrs. Richard Stuart from Chille. 3/9/1963, Albert Coya/Miami Herald Staff: Look, Ma! Culture! 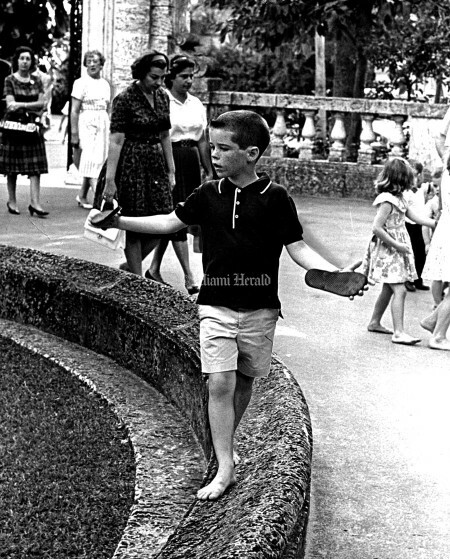 Pete Kelly, who is 7 years old and prefers bare feet, was among the 50-cent a head cultural bargain seekers Saturday at Vizcaya. The famed James Deering estate which practically drips with the stuff, will be open again today at the cut rate price in celebration of the estate. The usual admission is $1.25. 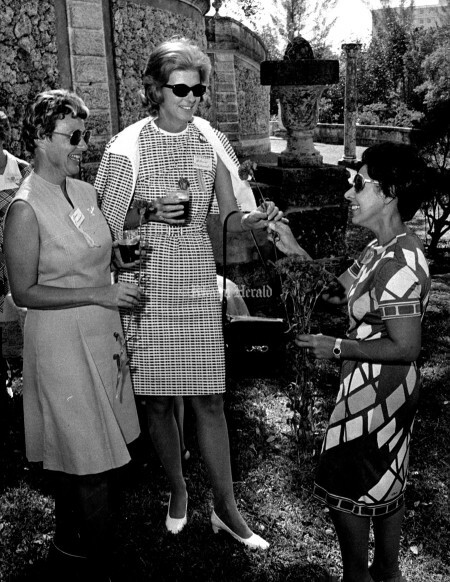 6/14/1965, John Walther/Miami Herald Staff: L to R Mrs Allan T. Reynolds; Mrs George D. Johnson Jr; Mrs Arthur Denchfield Jr and Mrs Robert Leonard. 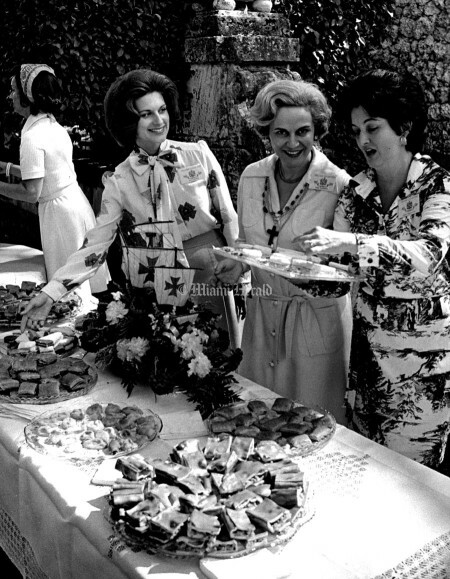 2/12/1974, Albert Coya/Miami Herald Staff: Mrs. Sam Marmaduke, from Texas, Mrs. Ed Rogers and Mrs. James Hines. 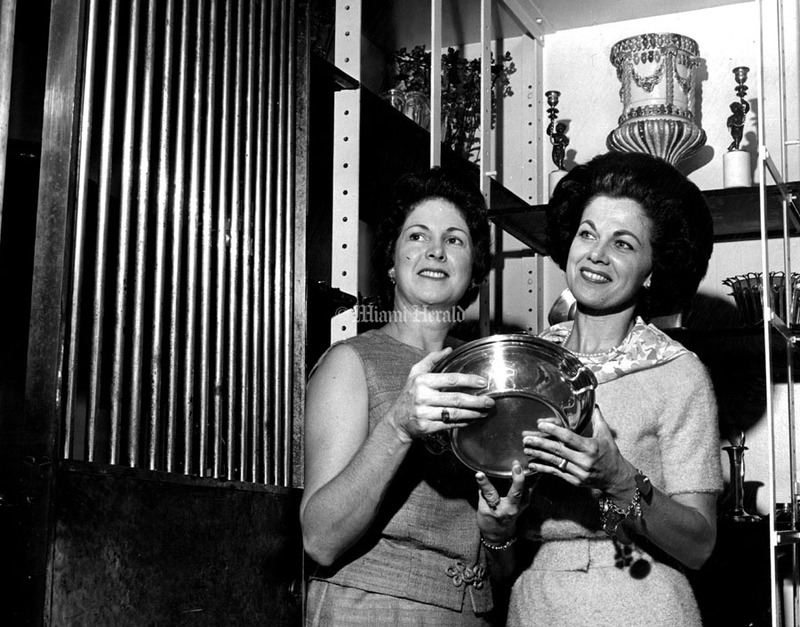 9/11/1959, Lewis McLain/Miami Herald Staff: Joe Aver and Ida Morris. 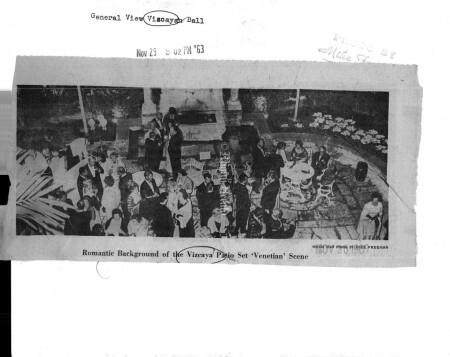 9/14/1959. 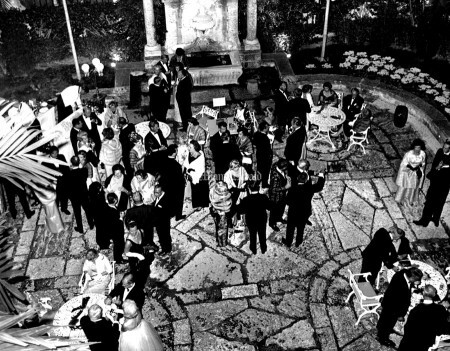 Lewis McLain/Miami Herald Staff: Members of The Younger Set will go back to school with memories of a festive evening st Vizcaya, the Dade County art museum. 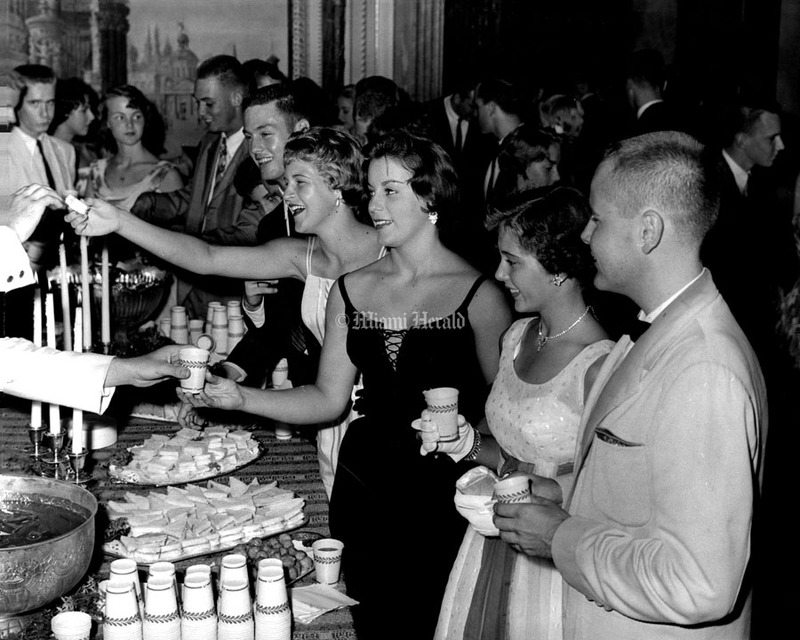 The high school and college crowd gathered there Friday night for a back-to-school dance. 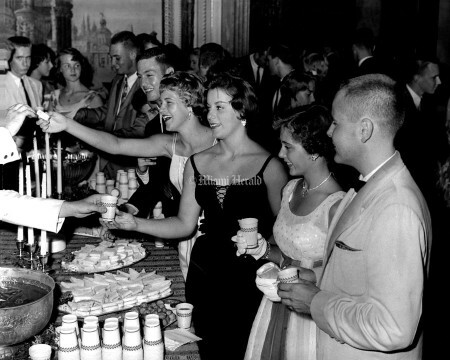 It was hard to tell which was more popular-the dancing to music of two orchestras, or the refreshment table loaded with punch, sandwiches and other goodies. 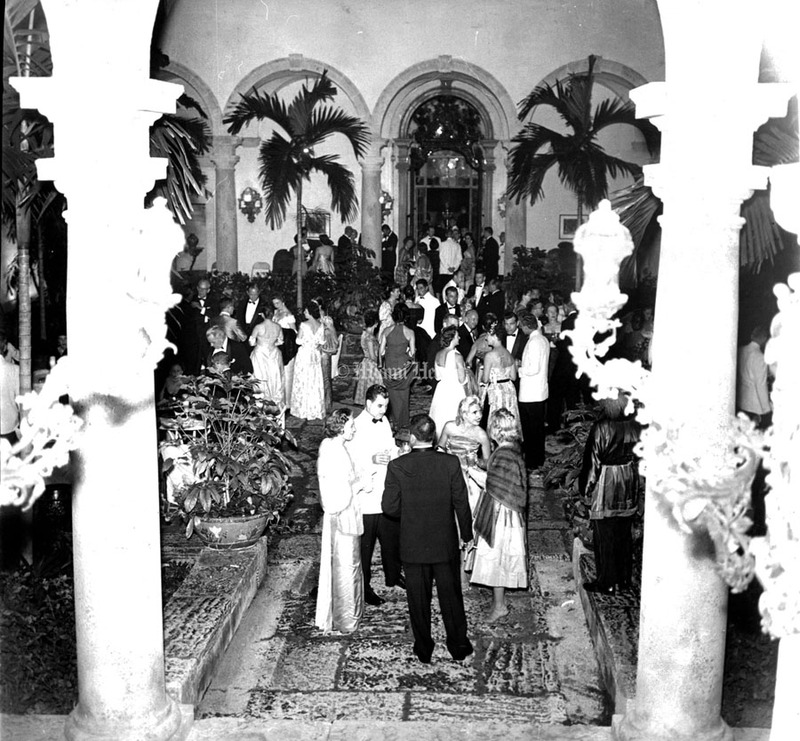 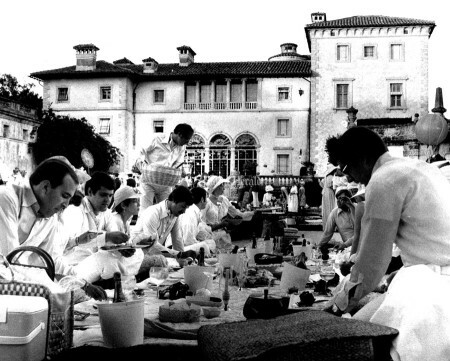 The Vizcayans sponsored the party for their sons and daughters, and their youngsters' friends. 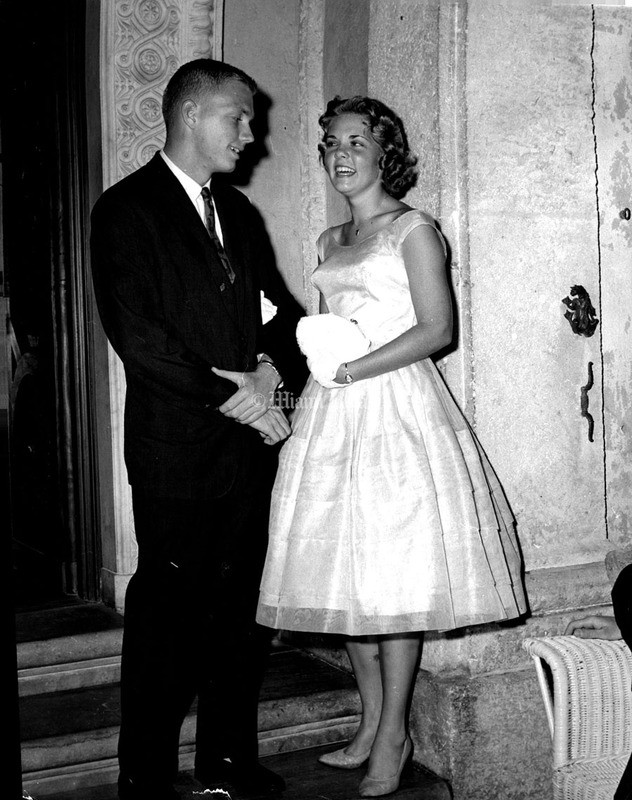 9/11/1959, Lewis McLain/Miami Herald Staff: Randy Cox at the Teenage Dance at Vizcaya. 4/8/1962, Ron Wahl/Miami Herald Staff: Vizcaya. 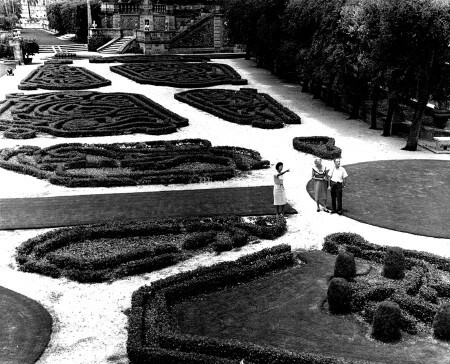 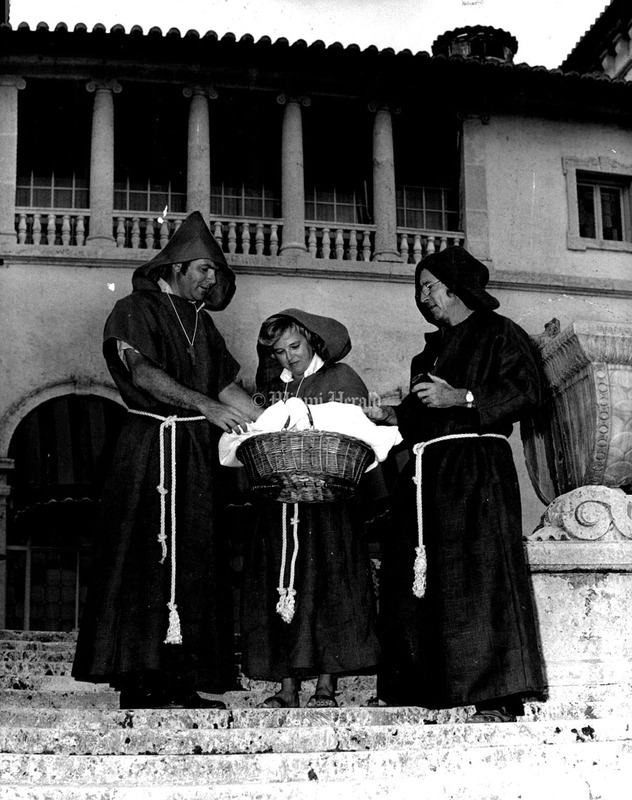 5/31/1961: At Vizcaya- Lawrence Burke family from Bronx, N.Y. & guide, Mrs.Turkington. 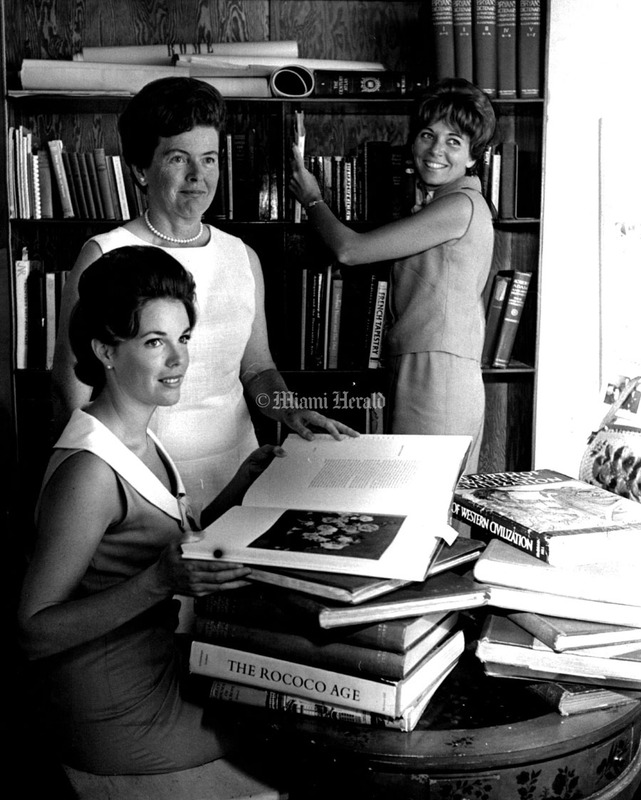 7/31/1966, Jim Birmingham/Miami Herald Staff: Vizcaya volunteer guides with renaissance books in their new library. L to R Mrs. Fredrick E. Reiling, Mrs. Laird H. Wallace and Mrs. Charles Wright. Undated: Guided Holiday: Where Do Vizcaya Volunteer guides go in the summer? Some of them spend time touring Vizcaya's Charms and seeking out unusual places and views which the "Million Milers" can show guests next season. 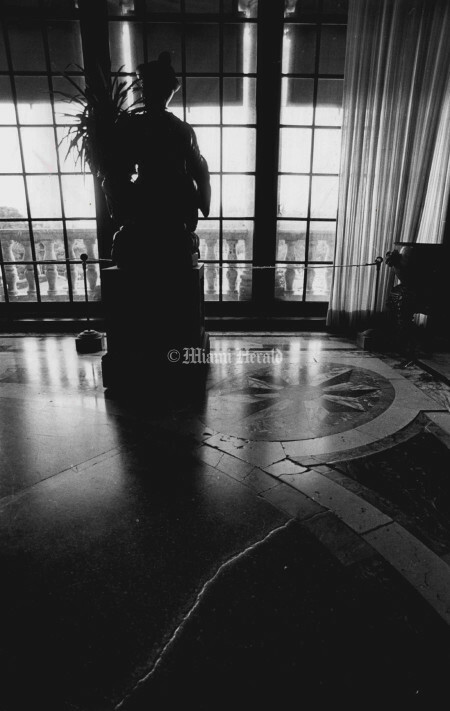 The much-walked guides are all volunteers who show school children, VIP's and Adults through the former James Deering Mansion from October through June on a regular daily 7-days a week schedule. 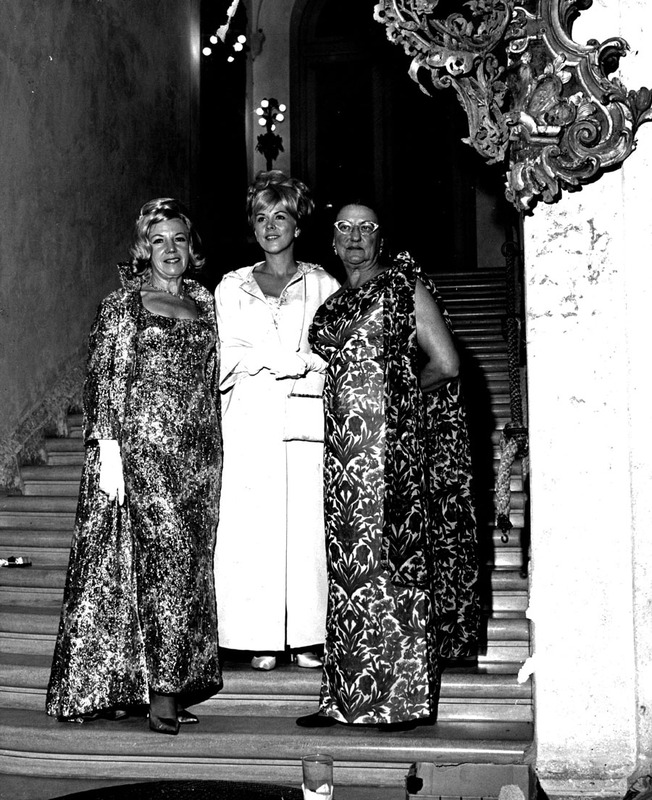 Shown here on a "busman's holiday" at the casino mound are (L-R) Hazel (Mrs. Chester) Davis, Frances (Mrs. Thomas J.) 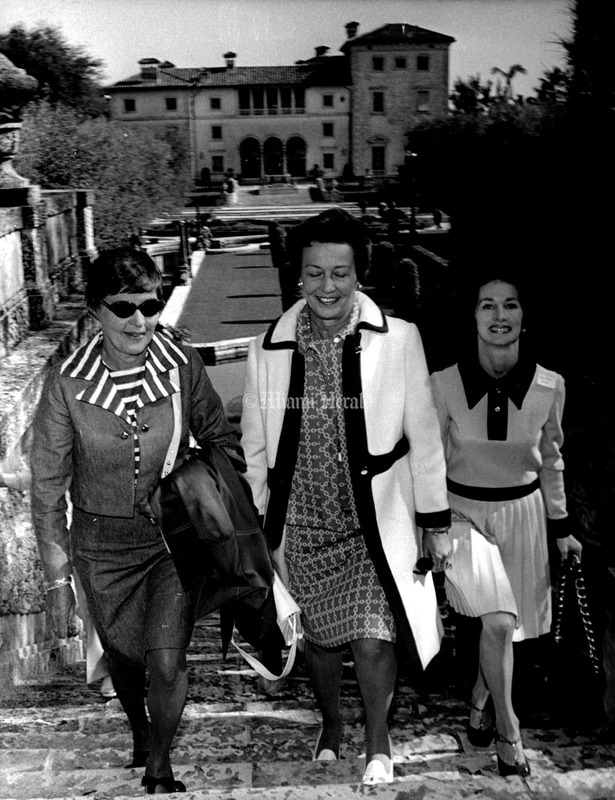 Stokes, Martha (Mrs. Carles) tours to 60,000 persons. They are accepting a few more guides now to Boost their membership to 100 by October.